Govt. Engineering College Bikaner, established in 1999. The college is a renowned institution in the field of Engineering, Management and Polytechnic education. 4000 students are presently studying in the college. College possesses 337 bighas of land on which construction work has been accomplished on 3 lac square feet. College has a budget of Rs 19 crores. Net worth of college building is 1400 lacs out of which, state govt. has provided 300 lacs. 4 colleges viz. Govt. Enginnering College Bikaner, Govt. College of Engineering & Technology, Govt. ECB Polytechnic and Govt. ECB ITI are running under Engineering College Bikaner society. Placements:Engineering college Bikaner (An Autonomous Institute of Government of Rajasthan) is one of the premier technological institutions in the western part of the Indian sub-continent. Established in the year 1999 in the city of Bikaner, Spreading over 300 Beghas of land (More than 9 lac square meters) and encompassing more than 5000 students, the institute is one of the largest govt. owned institutes of Rajasthan. Engineering College Bikaner is recognized as a benchmark institution in terms of defining the contours of quality engineering education for the technology colleges across the State of Rajasthan. It is an autonomous institution of the Government of Rajasthan and is academically affiliated to Rajasthan Technical University. The institute offers various Undergraduates and Postgraduate course and in fact the institution is one of the first to introduce ITI, Polytechnic, bachelors in Technology (B.Tech.) and Masters in Technology (M.tech.) courses under one roof. Apart from that ECB also offers Masters in Management and Masters in Computer Application along with their bachelor’s courses, thus student need not to go different places for education. The college has all the required infrastructure and excellent facilities for students to pursue their courses. The institute strives to improvise on the available facilities to make the student more equipped for the challenging and competitive corporate world. The institute is privileged to those who cleared the AIEEE and the test conducted by the institute. Training and Placement Cell is an integral part of the institute. The institute has provided complete infrastructure for effective functioning of the cell. In fact ECB is one of the few TCS accredited colleges in the state of Rajasthan. The college has been host of most of the industry luminaries for in-house training and placements of the students. Training activities are organized throughout the year in an effort towards preparing the prospective students for the campus selection programmes. The cell keeps on invites various industries and reputed firms for campus recruitment. The cell is sensitized to function all through the year towards generating placement and training opportunities for the students. Reputed industrial houses across the country visit our institute regularly for the campus recruitment programmes. The placement cell coordinates pretty well with the corporate sector and provides well-developed infrastructure to facilitate the campus selection programmes. The cell maintains a very convivial relationship with all the recruiting industries and also prepares the recruited candidates to face the competitive world through its 360 degree approach of personality grooming with the help of dedicated Personality Development Cell and Centre for ethics and Indian Management of the College. Campus: Govt. 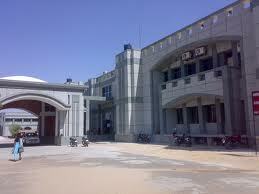 Engineering College Bikaner, established in 1999. The college is a renowned institution in the field of Engineering, Management and Polytechnic education. 4000 students are presently studying in the college. College possesses 337 bighas of land on which construction work has been accomplished on 3 lac square feet. College has a budget of Rs 19 crores. Net worth of college building is 1400 lacs out of which, state govt. has provided 300 lacs. 4 colleges viz. Govt. Enginnering College Bikaner, Govt. College of Engineering & Technology, Govt. ECB Polytechnic and Govt. ECB ITI are running under Engineering College Bikaner society. The college runs the courses like BE, MBA, MCA, M. Sc. (IT), BBA, BCA, Diploma and ITI. Result oriented committed 200 Faculty Members, 100% results, Excellent Placement, Centre for Ethics and Indian Management, World class Ceramic Centre, magnificent computer laboratories, gymnasium, cafeteria etc are salient features of this college. Hostel: Hostel life is one of the most enjoyable times of one’s life and this is no exception as far as ECB Hostel is concerned. Every hostel in the institute gives each individual ample opportunity to develop many qualities. It’s easy to make friends here. The comfortable atmosphere, the air of geniality and joviality makes everyone feels at home. After the initial homesickness, it actually does feel like a home in the later stages. Every efffort has been made at the College of Engineering & Technology, Bikaner to provide the best facilities for students. Every student has access to a wide range of activities, facilities and support. Besides the regular hostel dining facilities, there are affordable food services on campus that provide inexpensive and easily accessible lunchtime or evening options. ECB has nine hostels. There are Six Boy’s Hostels, which accommodate 760 students in two and three-bed rooms. A gym facility is also attached. The Three Girl’s Hostels have room for 305 students. ECB, with its beautifully landscaped and carefully tended gardens, provides an ideal environment for a congenial learning experience. Hostel campus invites students out of their hostels to spend time between midst greenery and a riot of floral color. Sir I have got 70 marks in jee main 2016 in obc category and 64.8%in bseb 12th can I get admission in government engineering college bikaner at cse branch? ? Sir I have got 70 marks in jee main 2016 in obc category and 64.8% from bihar board 12th can I get admission in government engineering college bikaner at cse branch? ?